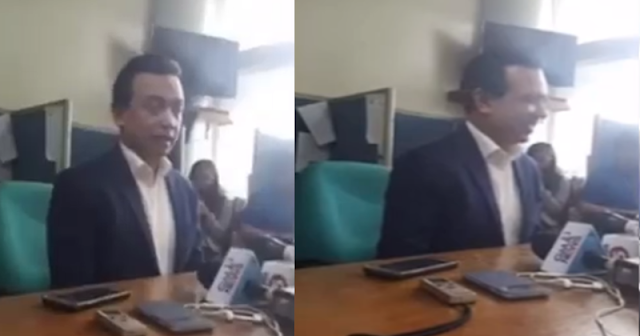 Senator Antonio Trillanes was caught on camera being coached by media men and was rehearsing his interview and he was told to put in "more feelings" for his second take. In a video shared by the Facebook page Thinking Minds, Trillanes is seen to have spoken, but stopped and requested a retake. While answering the question, Trillanes stopped and said "Ano ulitin natin?" A media man from behind the camera said yes, and suggested that he say the answer with feelings. In the video, it can be seen that his interviewees were members of the mainstream media, with network names of GMA News and TV 5 printed on the microphones that were facing him. The blogsite Pinoy Thinking also shared news of the video and asked, "What was that? Why were they retaking the video? ", implying that theren mightbe a conspiracy going on. Meanwhile, netizens who have seen the video gave mostly negative perspectives on it. A Rebecca Matondocalled him, the "most hated human being in the Philippines". "It's not only fake news. But now they have fake interview," said an Erwin Go. Elvie Cabebe said, "Ano ba yan Trililing? Hindi ka artista para mag-rehearsal at mag-take two sa iyong presscon, tingin pa lang sa iyo alam na agad ang pagiging fake ng sinasabi mo!" Trillanes is one of the biggest figures of the opposition of the administration of President Rodrigo Roa Duterte. “Go ahead, Mr. Duterte, order somebody to shoot me and, I assure you, it would lead to your end,” the opposition senator said in a statement. Trillanes' term will end next year and he said that he has no plans of pursuing another political office. "[B]ut I won’t disappear. I will continue with my advocacy. I will still stand up to Duterte. I will show him that I don’t need a position to stand up to him,” he said. “Let him do his worst. I will show him how cowardly he is. ‘Look, I have no more position. Go ahead," he said when asked if he feared for his life when the time comes that he is no longer in office.